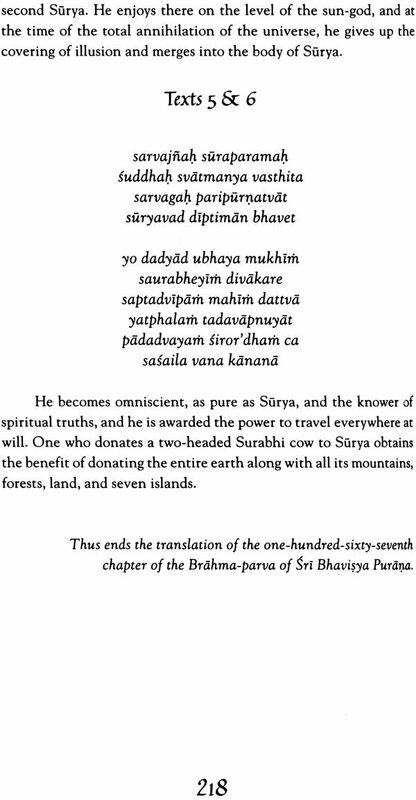 Later, in the Srimad-Bhagavatam (12.13.4-9), when the number of verses contained I each of these major Puranas is listed, it is said: the Bhavisya Purana (consists of) fourteen thousand five hundred (verses). 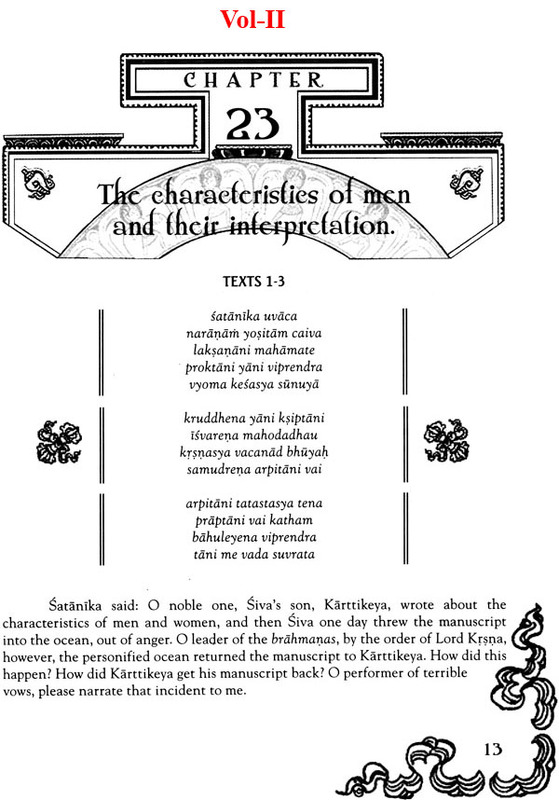 There are statements in other places, however, that indicate that the Bhavisya Purana contains as many as twenty-six thousand verses. 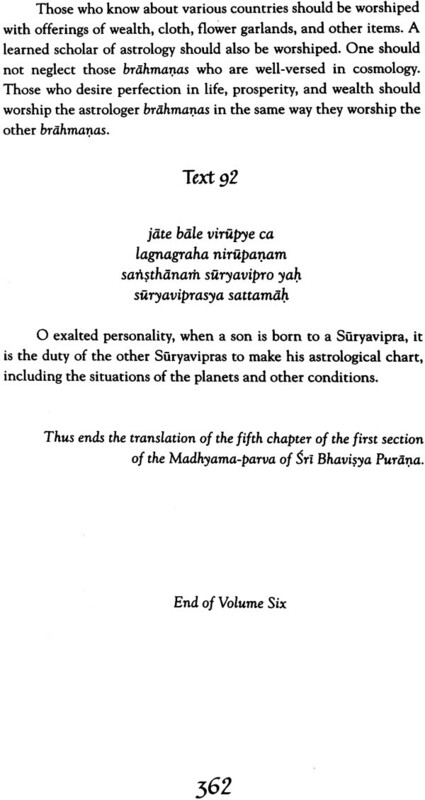 This present edition of the Bhavisya Purana is divided into four parts ? 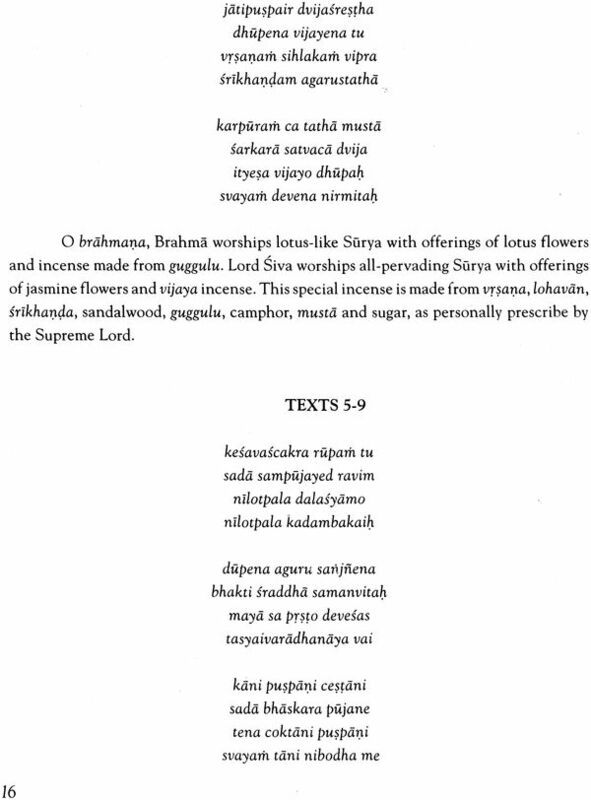 Brahma Parva, Madhyama Parva, Pratisarga Parva, and Uttara Parva. 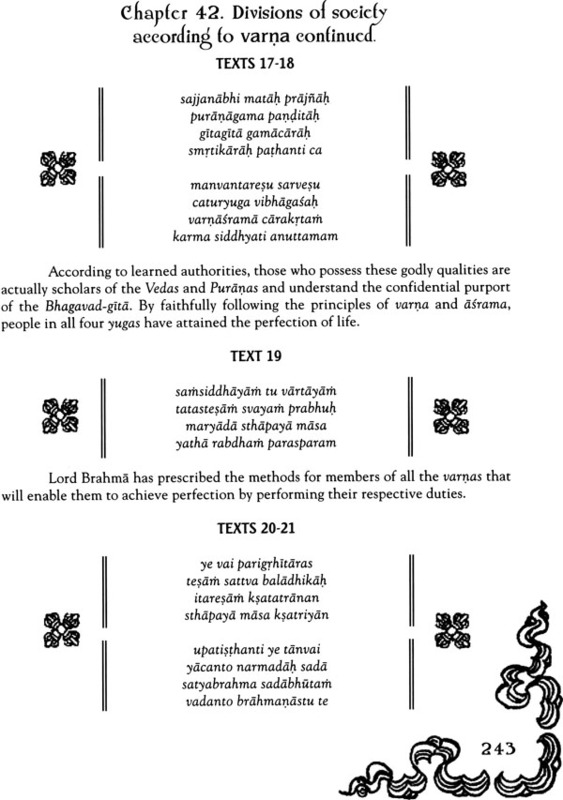 The Brahma Parva consists of two hundred sixteen chapters, the Madhyama Parva consists of sixty-two chapters, the Pratisarga Parva consists of one hundred chapters, and the Uttara Parva consists of two hundred eight chapters. 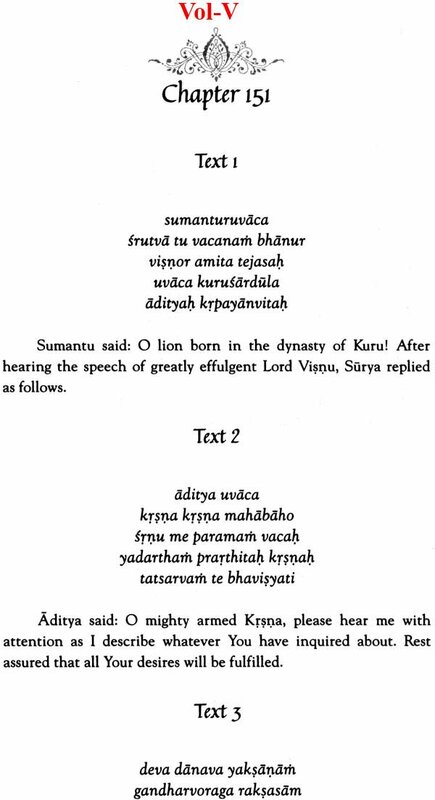 This is the first edition of an English Bhavisya Purana to be published and so naturally it will be of interest to scholars of Vedic literature. As the name implies, this book gives predictions into the future and this is of special interest to one and all. 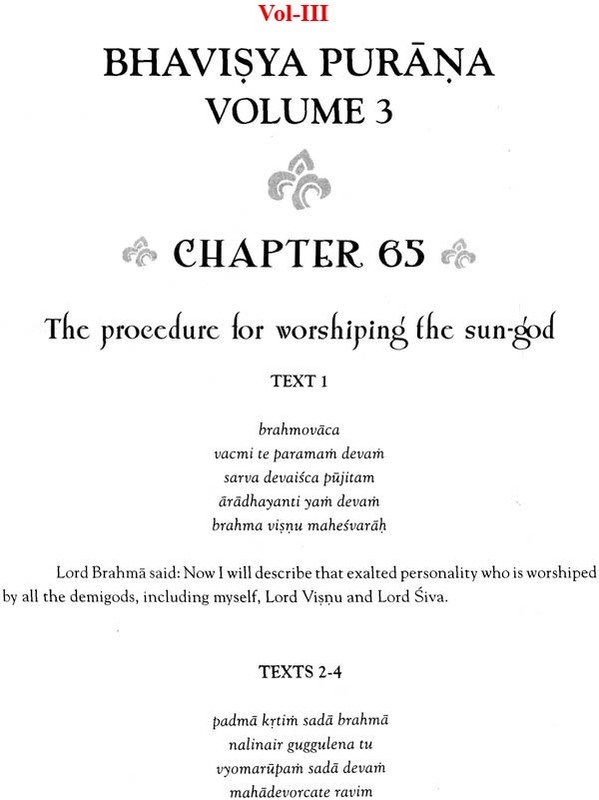 This second volume deals primarily with the worship of the sun-god. While going though this volume, you may become puzzled because the glorification of the sun-god seems to indicate that he is the Supreme Personality of Godhead. In the chapter summary of Canto Five, chapter twenty-two of Srimad-Bhagavatam, Srila Prabhupada wrote: The sun-god, who controls the affairs of the entire universe, especially in regard to heat, light, seasonal changes and so on, is considered an expansion on Narayana. A similar statement is there is the Bhavisya Purana, in which it is said, "Even if born of a lowly family, a person who follows the Ratha-yatra car when the Deities pass in front or fro behind will surely be elevated to the position of achieving equal opulence with Visnu." 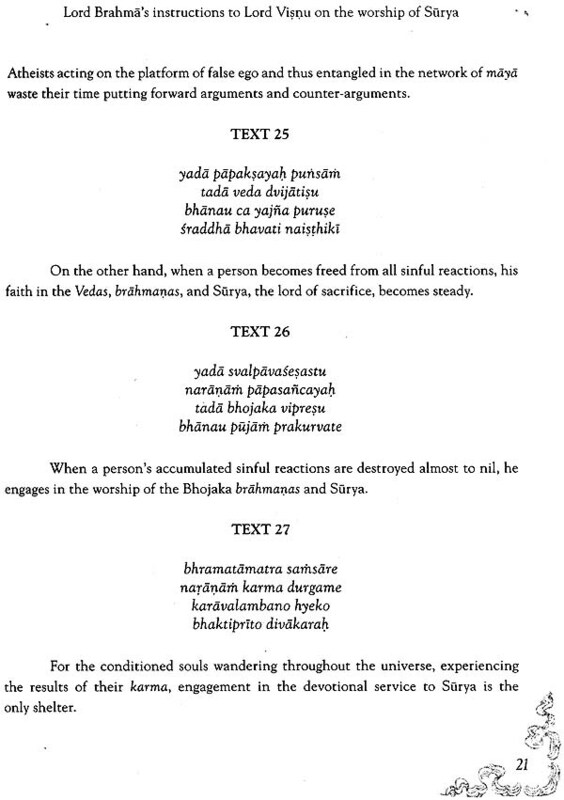 There are eighteen major Puranas, as stated in the Srimad-Bhagavatam (12.7.23-24): The eighteen major Puranas are the Brahma, Padma, Visnu, Siva, Linga, Garuda, Narada, Bhagavata, Agni, Skanda, Bhavisya, Brahma-vaivarta, Markandeya Vamana, Varaha, Matsya, Kurma and Brahmanda Puranas. 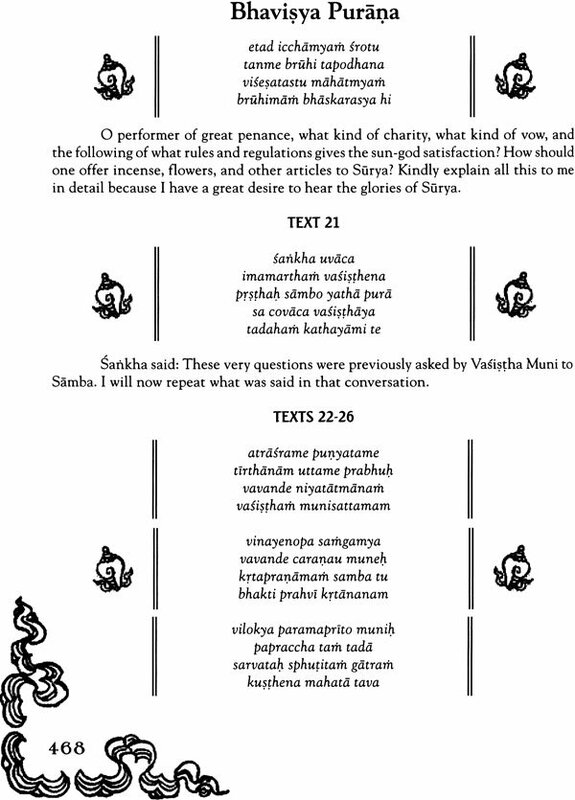 The number of verses in each Purana is listed in other verses of the Srimad-Bhagavatam (12.13.4-9): The Brahma Purana consists of ten thousand verses, the Padma Purana of fifty-five thousand, Sri Visnu Purana of twenty-three thousand, the Siva Purana of twenty-four thousand and Srimad-Bhagavatam of eighteen thousand. The Narada Purana has twenty-five thousand verses, the Markandeya Purana nine thousand, the Agni purana fifteen thousand four hundred, the Bhavisya Purana fourteen thousand five hundred, the Brahma-vaivarta Purana eighteen thousand and the Linga Purana eleven thousand . 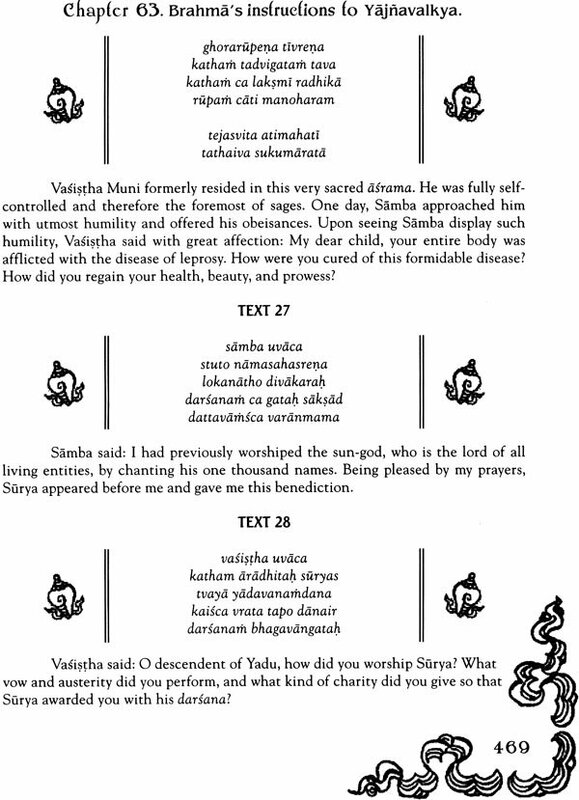 The Varaha Purana contains twenty-four thousand verses, the Skanda Puranas eight-one thousand one hundred, the Vamana Purana fourteen thousand, the Garuda Purana nineteen thousand and the Brahmanda Purana twelve thousand. 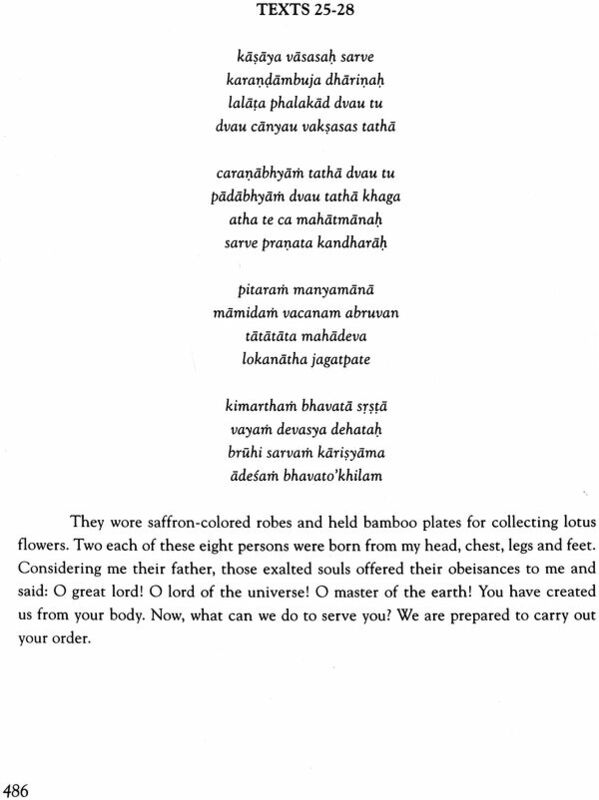 Thus the total number of verses in all the Puranas is four hundred thousand. 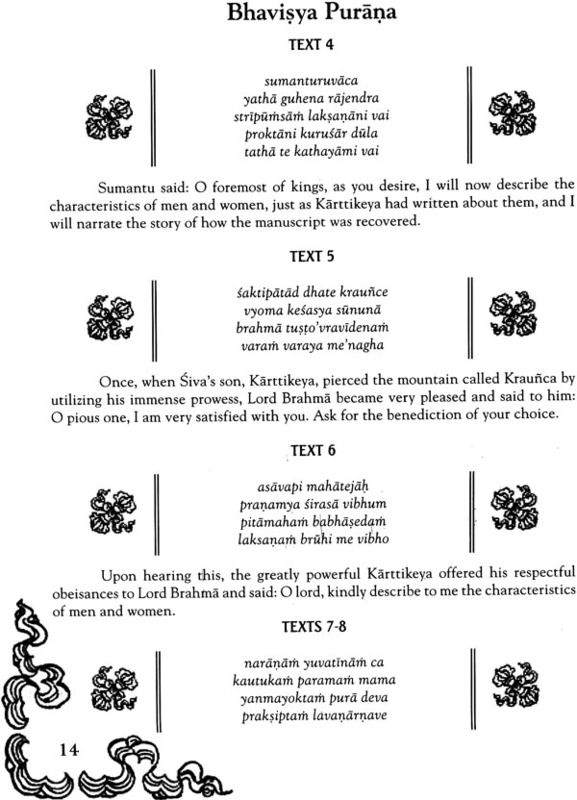 Eighteen thousand of these, once again, belong to the beautiful Bhagavatam. 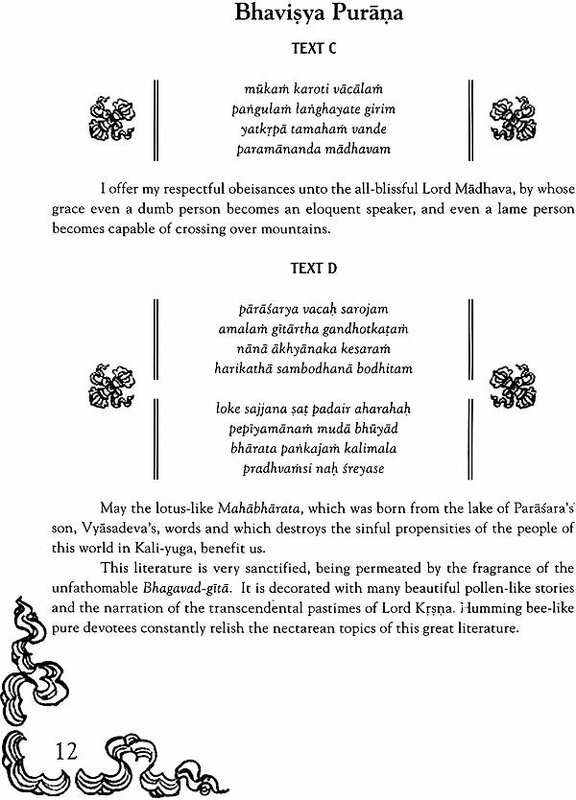 This is the first edition of an English Bhavisya purana to be published ad so naturally it will be if interest to scholars of Vedic literature. As the name implies, this book gives predictions into the future and this is if special interest to one all. 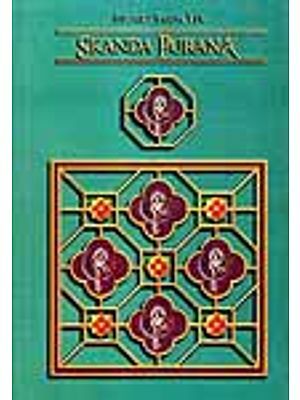 This second volume deals primarily with worship of the sun-god. While going though this volume, you may become puzzled because the glorification of the sun-god seems to indicate that e is the Supreme Personality of Godhead. 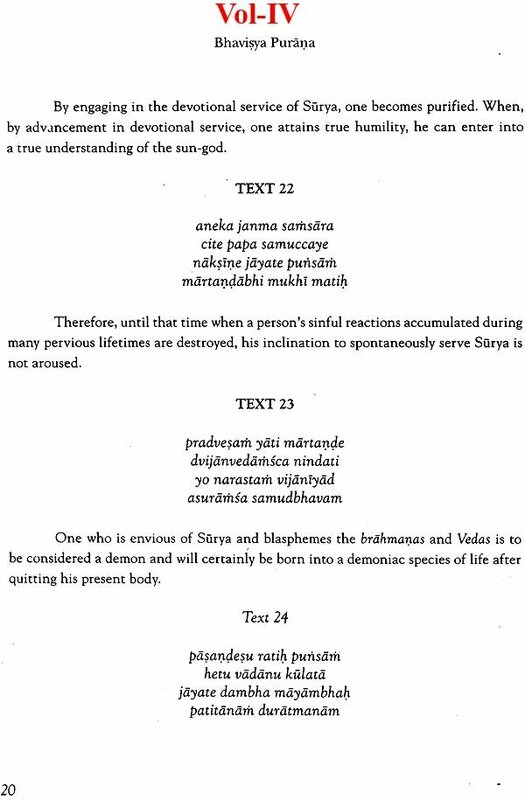 In the chapter summary of Canto Five, chapter twenty-two of Srimad-Bhagavatam, Srila Prabhupada wrote: The sun-god, who controls the affairs of the entire universe, especially in regard to heat, light, seasonal changes ad so on, is considered an expansion of Narayana. 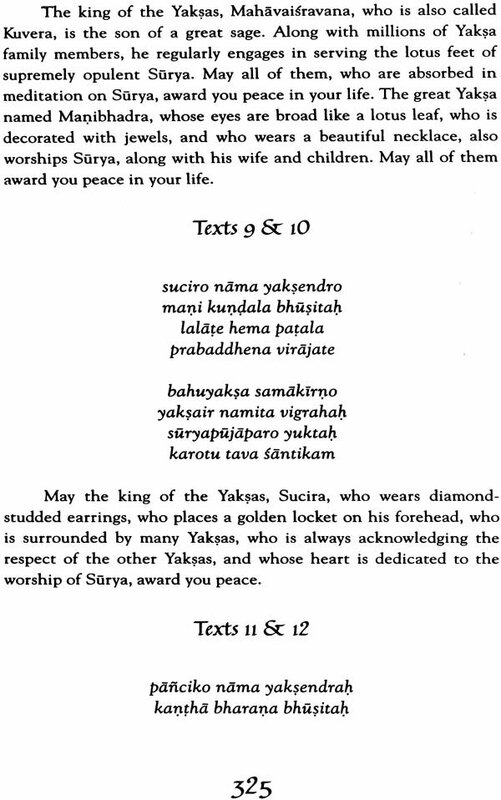 He represents the three Vedas-Rg, Yajur and Sama-and therefore he is known as Trayimaya, the form of Lord Narayana. 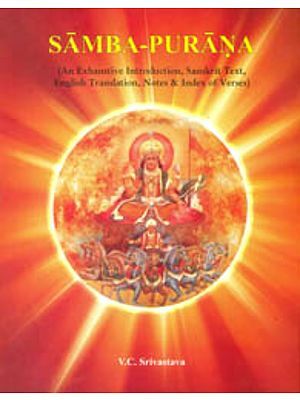 Sometimes the sun-god is also called Surya Narayana. The sun-god has expanded himself in twelve divisions, and thus he controls the six seasonal changes and causes winter, summer, rain and so on. 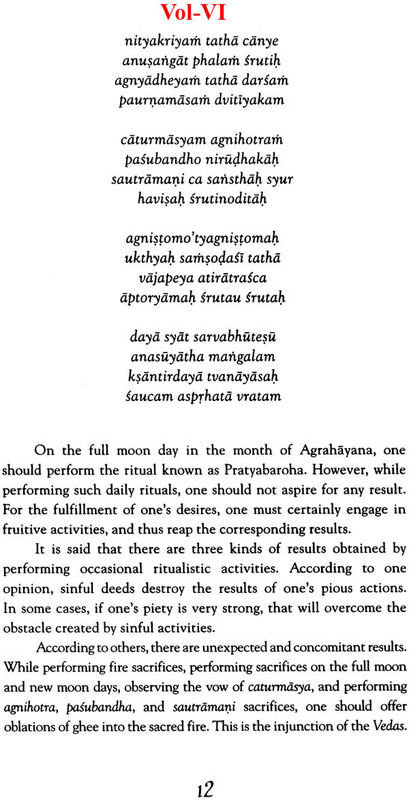 Yogis and karmis following the varnasrama institution, who practice hatha or Astanga-yoga or who perform agnihotra sacrifices, worship Surya Narayana for their own benefit. The demigod Surya is always in touch with the Supreme personality of Godhead, Narayana. As explained in this volume, the sun-god is not merely one of the demigods. This is confirmed by Srila Prabhupada in his purport to Srimad-Bhagavatam 5.23.3: It is also significant that the predominating deities of even the greatest planets have been of fered their exalted posts because of the very valuable pious activities they performed in previous births. 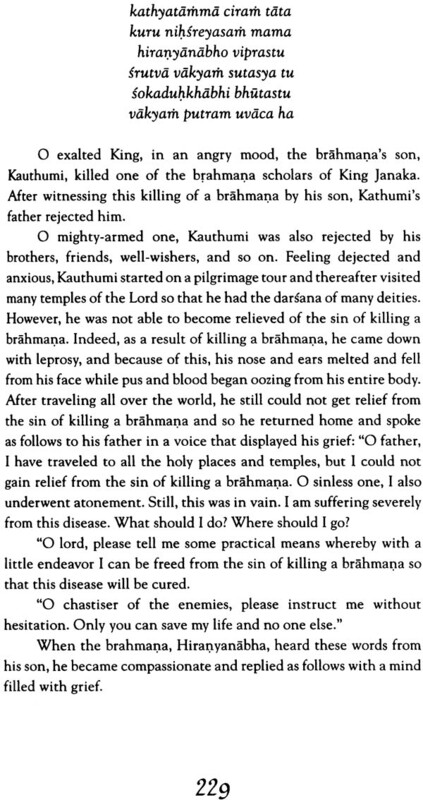 This is indicated herein by the words karma-nirmita-gatayah. For example, as we have previously discussed, the moon in called Jiva, which means that he is a living entity like us, but because of his pious activities he has been appointed to his post as the moon-god. 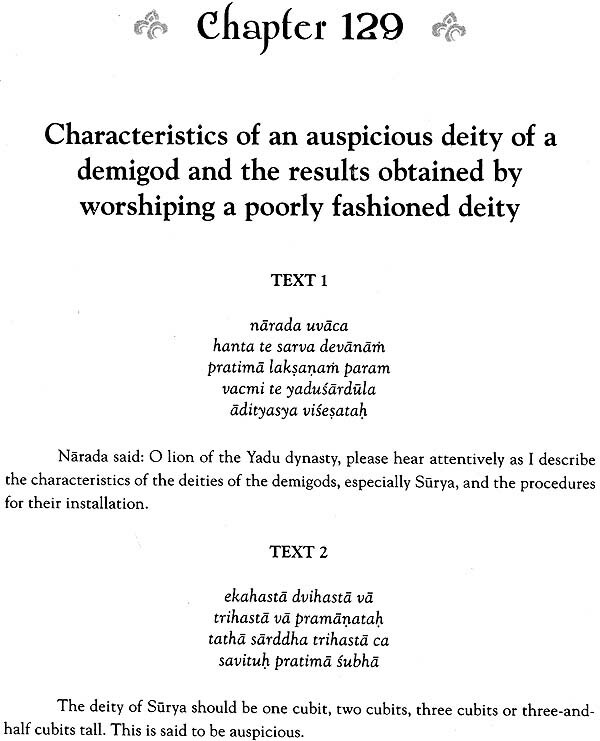 Similarly, all the demigods are living entities who have been appointed to their various posts as the masters of the moon, the earth, Venus and so on because of their great service and pious acts. Only the predominating deity of the sun, Surya Narayana, is an incarnation of the Supreme Personality of Godhead. 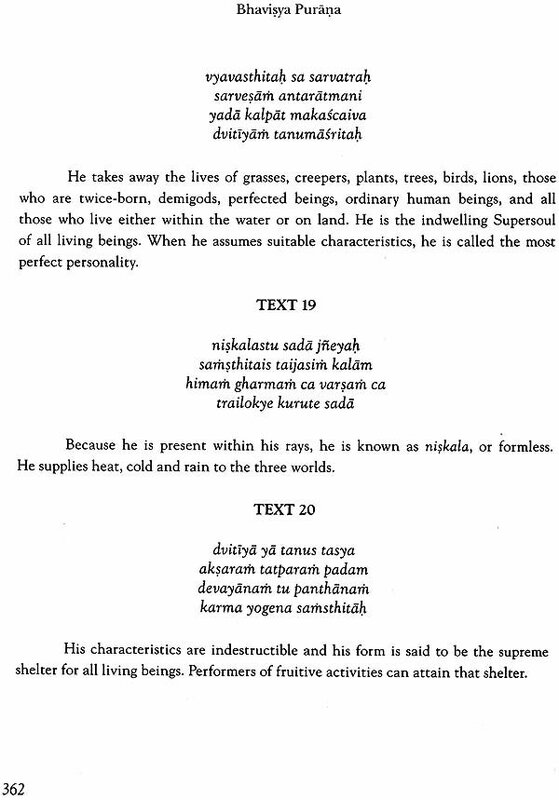 At the end of this volume, Surya himself discloses the fact that he is not the Supreme Personality of Godhead. When asked who he worships, he responds that he worships the Supreme Lord, who is his eternal master. It is advised that for achieving good health and a cure for a diseased condition, one should worship the sun-god. With this in mind, let me hope that these words find you in good health. The Bhavisya Purana is one of the eighteen major Puranas as stated in the text of srimad Bhagavatam (12.7.23-24): The eighteen major Purana are the Brahma Padma, Visnua, Siva, Lingna, Garuda, Narada, Bhagavata, Agni, Skanda, Bhavisya, Brahma-Vaivarta, Markandya, Vamana, Varaha, Matsya, Kurma and Brahmanda Puranas. 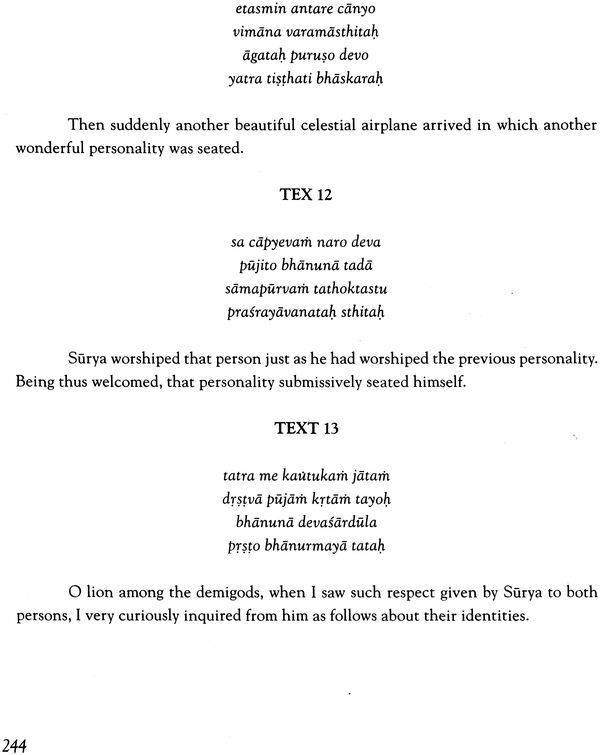 Later in the Srimad Bhagavatam (12.13.4-9) when the number of verses contained in each of these major puranas is listed it is said; the Bhavisya Puranas (consists of ) fourteen thousand five hundred (verses). 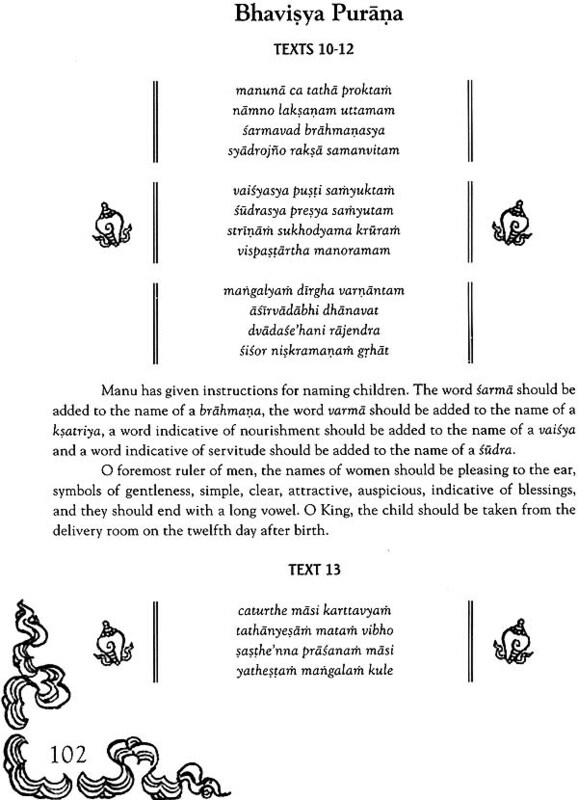 This present edition of the Bhavisya Purana is divided into four parts Brahma Parva Madhyama Parva, Pratisarga Parva, and Uttara Parva. It is generally understood that the Puranas deal with ancient histories not only on this planet but on planets throughout the universe. The specific appeal of this Purana, however, is that it narrates incidents that will occur in the future as well as account that happened in the distant part. 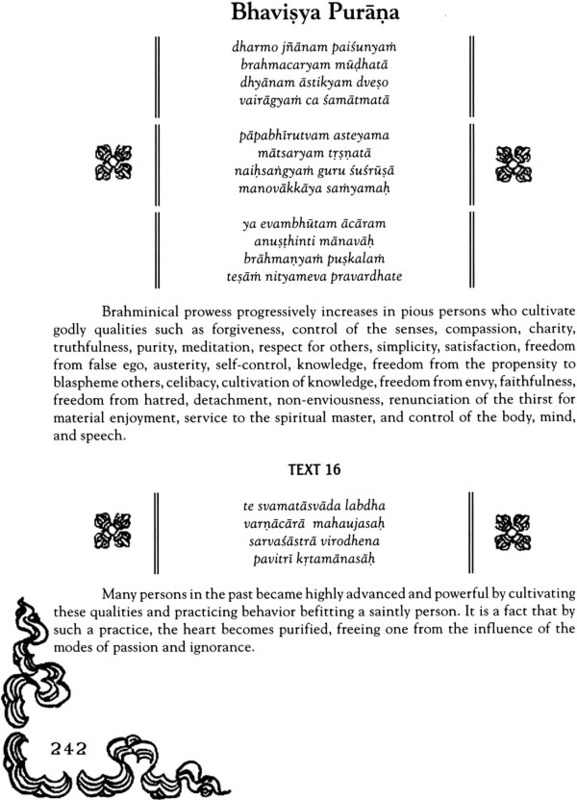 The Bhavisya Purana is one of the eighteen major Puranas. The specific appeal of this Purana is that it narrates incidents that will occur in the future as well as account that happened in the distant past. Lord Brahma said: Now I will describe that exalted personality who is worshiped by all the demigod including myself Lord Vishnu and Lord Siva. The Vedic understanding is that the gross body of a living entity is manifested according to the condition of the subtle body or mind. Thus the condition of one gross body indicates the previous mentality of a person and this process is carried on from one moment to the next. Why does someone have particular bodily features and what do they indicate? The Bhavisya Purana is one of the eighteen major Purana as stated in the text of Srimad Bhagavatam (12.7.23-24): The eighteen major Puranas are the Brahma, Padma, Visnu, Siva, Linga, Garuda, Narada, Bhagavata, Agni, Skanda, Bhavisya, Brahamavaivarta, Markanddeya, Vamana, Varaha, Matsya, Kurma and Brahmanda Puranas. 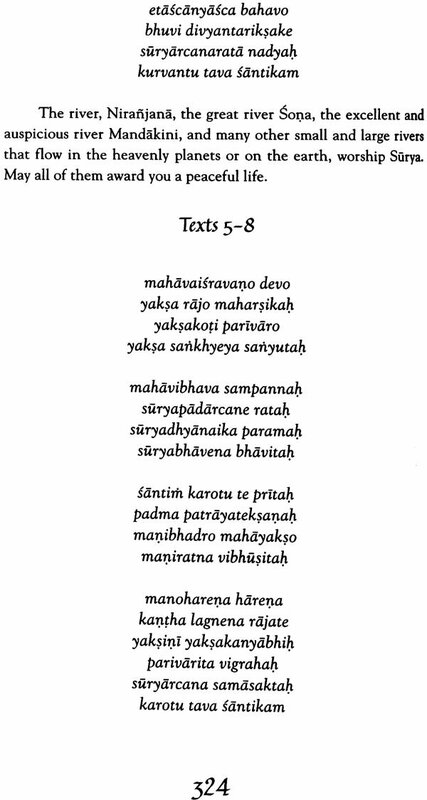 Later in the Srimad Bhagavatam (12.13.4-9) when the number of verses contained in each of these major Puranas is listed it is said; the Bhavisya Purana (consists of) fourteen thousand five hundred (verses). There are statement in other places however that indicate that the Bhavisya Purana contains as many as twenty six thousand verses. 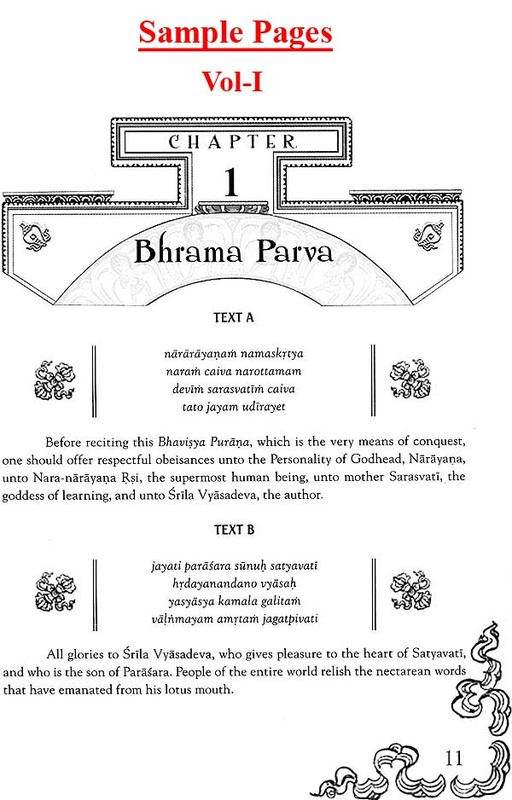 This present edition of the Bhavisya Purana is divided into four part Brahma Parva Madhyama Parva pratisarga Parva and Uttara Parva. 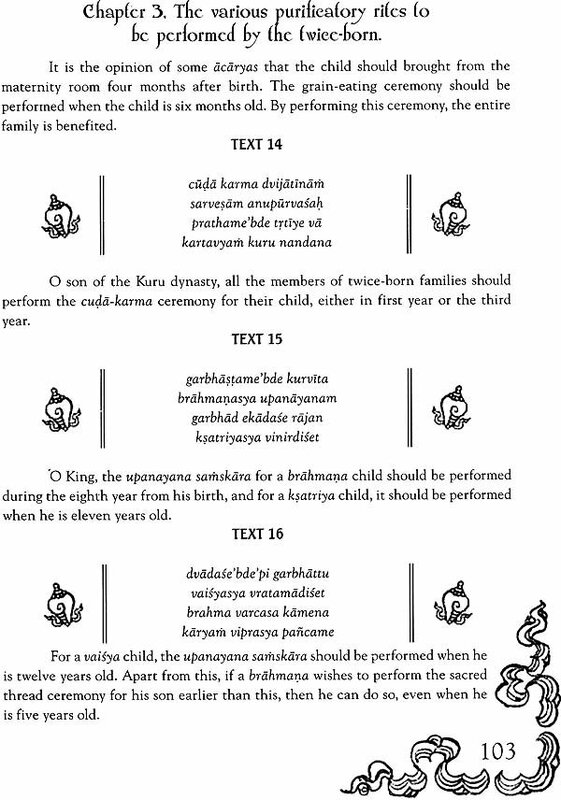 The of sixty two chapter the pratisarga Parv consists of one hundred chapter and the Uttara Purva consists of two hundred eight chapter. It is generally understood that the Puranas deal with ancient histories not only on this planet but on planets throughout the universe. The specific appeal of this Puranas however is that it narrates incidents that will occur in the future as well as accounts that happened in the distant past. 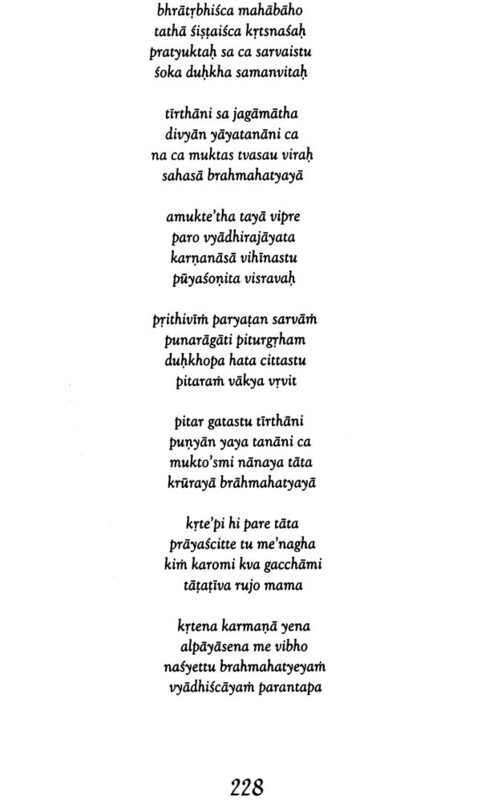 Tamala Krsna: He says he read a passage of the Bhavisya Maha Purna written by Vyasadeva three thousand years before Christ foretelling Jesus Christs Presence in there any other Prophecies in the Bhavisya Maha Purana or in any other scripture telling more accurately jesus Christ birthday. 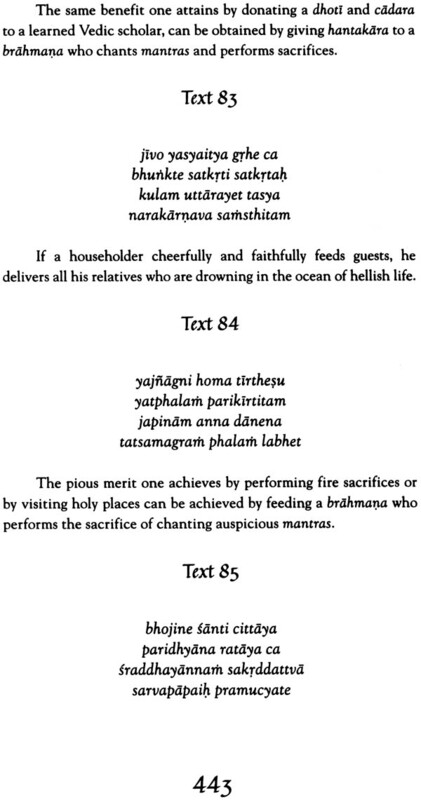 And again: In the Bhavisya Purana there is a statement about observing different ceremonies celebrating the Lord appearance (birthday) and other transcendental activities. It is said My Lord Janardana (Krsna) please let us know the date when your mother Devaki devi gave birth to you. If you kindly inform us about this then we shall observe a great celebration on this date. 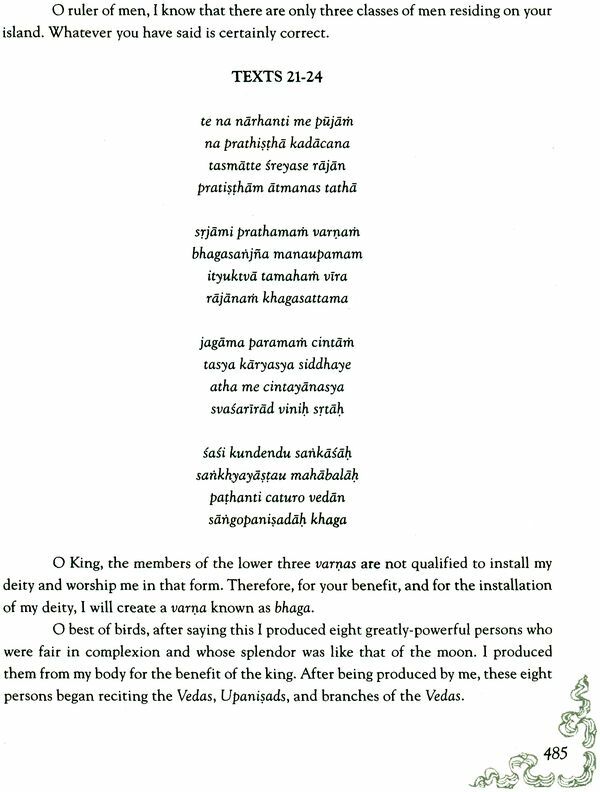 O killer of Kesi we are soul one hundred percent surrendered unto your lotus feet and we wish only to please you with our ceremonies. The vedic understanding is that the gross body of a living entity is manifested according to the condition of the subtle body or mind. Thus the condition of one gross body indicates the previous mentality of a person and this process is carried on from one moment the next. Why does someone have particular bodily feature and what do any indicate? 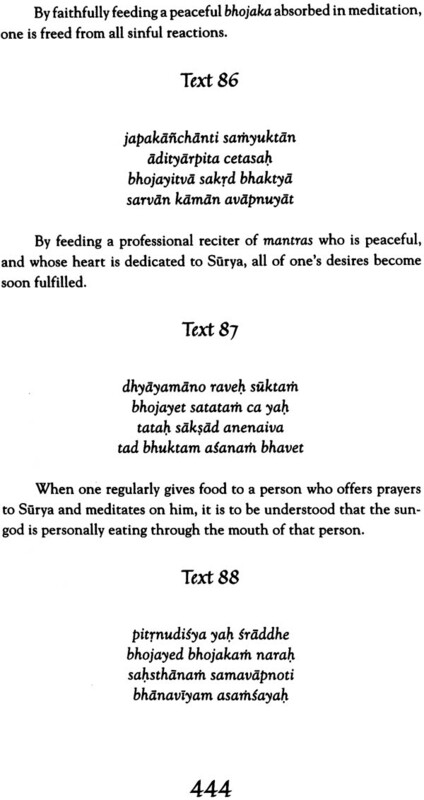 This is the subtle science that is explained in this volume of this Bhavidya Purana. 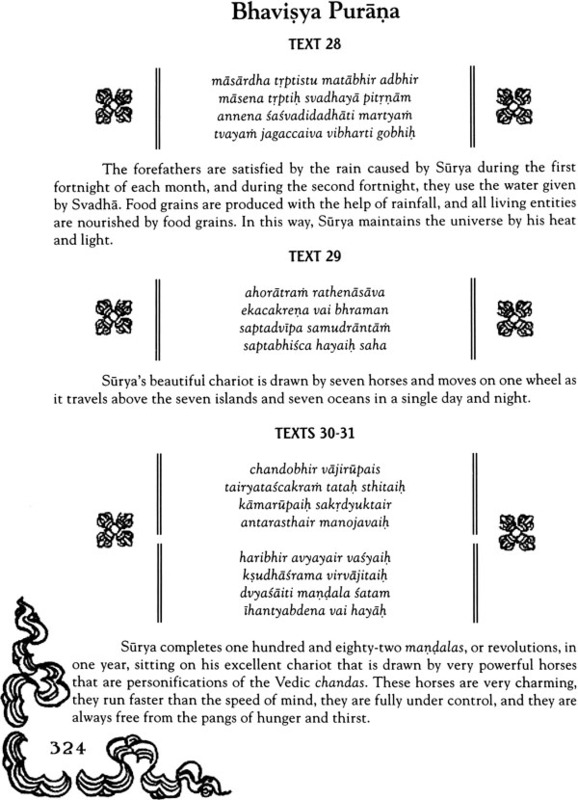 This present edition is in response to the many requests for an English edition of the Bhavisya Purana and its is the first thus filling a big gap in our library of Vedic literature. 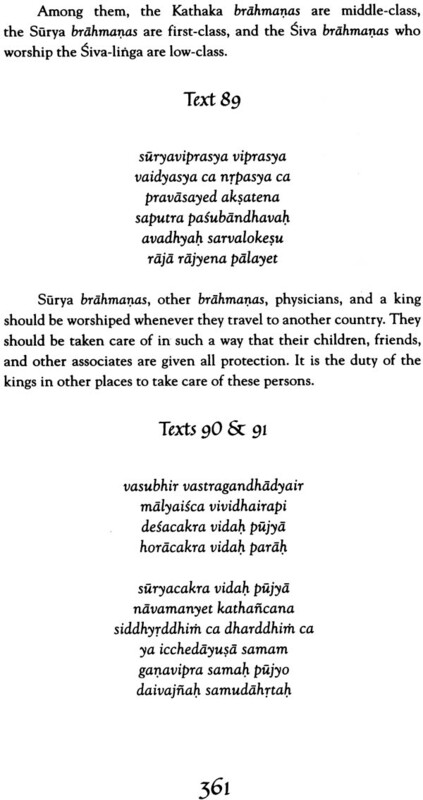 The Bhavisya Purana is one of the eighteen major Puranas as stated in the text of Srimad Bhagavatam the eighteen major Puranas are Bramha Padma Visnu Siva Linga Garuda Narada Bhagavata Agni Skanda Bhavisya Brahma vaivarta Markandeya vamana varaha matsya Korma and Brahmanda Puranas Later in the Srima Bhagavatam when the number of verses contained in each of these major Puranas is listed It is said the Bhavisya Purana Consists of fourteen thousand five hundred verses this present edition of the Bhavisya Parva Madhyama Parva Pratisarga Parva and Uttara Parva . 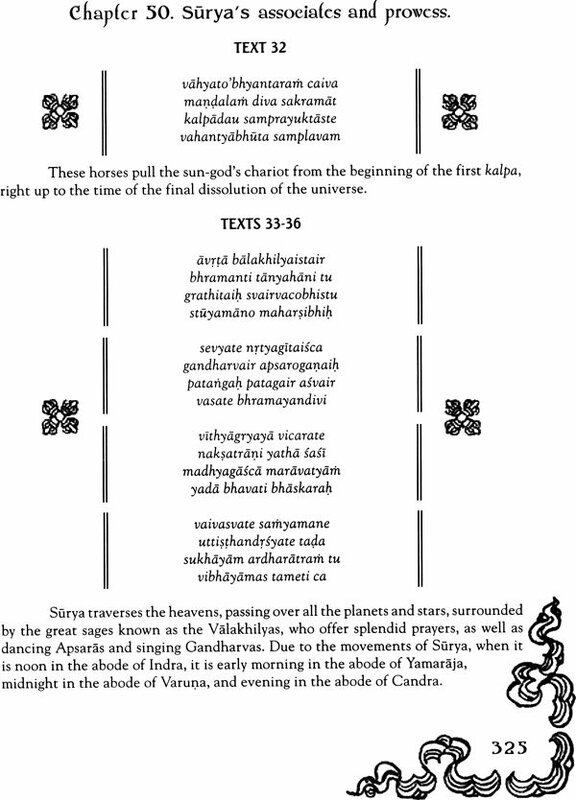 It is generally understood that the Puranas deal with ancient histories not only on this planet but on planets throughout the universe the specific appeal of this Purana however is that it narrates incidents will occur in the future as well as accounts that happened in the distant past. The Bhavisya Purana is one of the eighteen major Puranas. The specific appeal of This Purana is that it narrates incidents that will occur in the future , as well as accounts that happened in the distant Past. In the first volume of Bhavisya Purana there are no future predictions, but as in all the Puranas, there is much of great interest. In this Volume there is an elaborate exposition of the auspicious and inauspicious characteristics of men and women, and in the course of this Description, there is much information on Vedic physiognomy. This Volume also contains the beginning of an elaborate description of the significance of each of the days of the fortnight, beginning with the first, or pratipada. 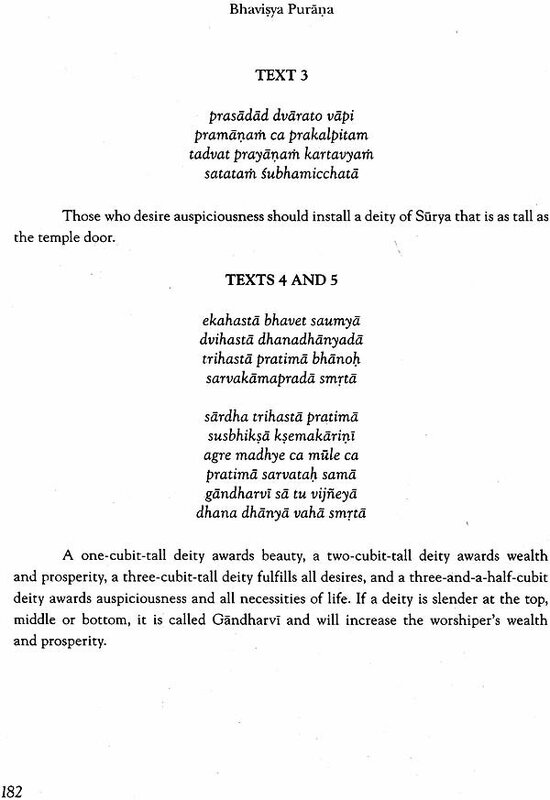 And, of course, there are stories to illustrate whatever is being explained and in this volume, there is the very interesting story of how lord Brahma's fifth head was severed, and for what reason. Thus, the condition of one's gross body indicates the previous mentality of a person, and this Process is carried on forms one moment to the next. Why does someone have particular bodily features, and what to do they indicate?